Giraffes are the tallest land animal in the world. A male stands up to 5.5m high, and weighs nearly two tonnes. Their legs, measuring approximately 6ft long, are taller than most humans. Giraffes are under threat, both in captivity and in the wild. Wild giraffes have been extensively hunted for their meat, but today their main threat is loss of habitat. Wild giraffes live complex lives and roam large expanses, so being confined to small enclosures can lead to extreme frustration and boredom. 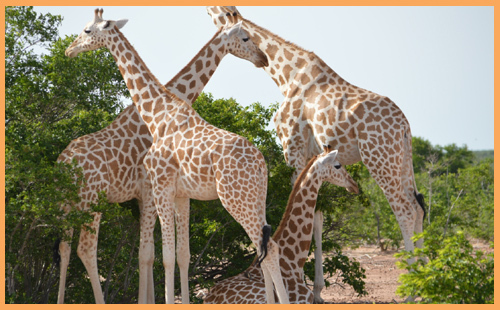 Funds from your adoption will support our work with the Giraffe Conservation Foundation to protect threatened giraffes in Niger and across Africa. You can help ensure their future by adopting our giraffe family below. These unique long-legged animals are the tallest animal on the planet. They live in Niger in West Africa and face some tough challenges – they are the rarest giraffes in the world. Help us keep this endangered family safe.